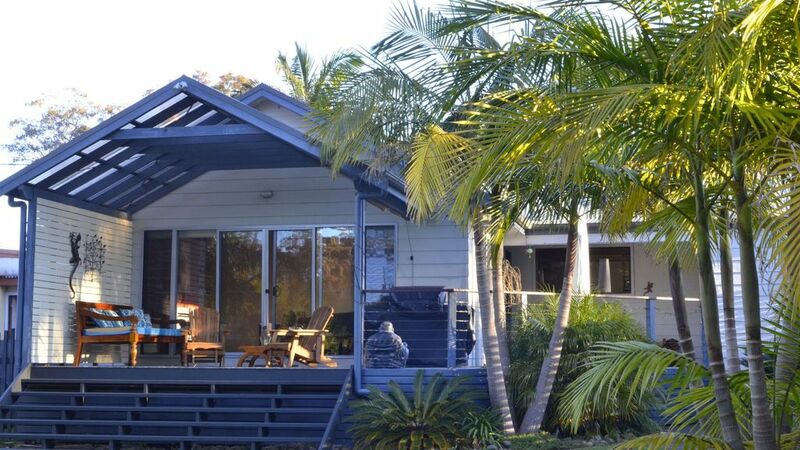 4 Bedrooms, 2 Bathroom, close to lake and Hyams Beach and National Park. Are you looking for some "serenity" and a great place to relax while everyone has some space? Come and stay at the The Palms, Erowal Bay. The backyard and deck take centre stage, allowing visitors to connect with the tranquillity and peacefulness the South Coast has to offer. There is an expansive deck surrounded by tall palm trees, with sun lounges and a day bed looking over a vast garden. Guests can gather around the large outdoor table, with seating for ten, and enjoy a BBQ under the bright evening stars. The manicured lawn is perfect for energetic kids or pets, or just some where to gaze. The secret garden at the end is ideal for young and old to explore. Australia’s native birds can be heard as you wake, and Erowal Bay’s colony of Kangaroos are ever present in the front yard, making their way down to the lake just two minutes away, perfect for any watercraft. In Winter enjoy the wood fire, plus gas heating and curl up with a book or a good movie on the huge lounge. The Palms is close to the beautiful beaches of Jervis Bay, including the whitest sands in the world of Hyams Beach. The area is renowned for dolphin sightings and whale watching, and the nearby National Park brings visitors into the heart of outdoor life. The Palms is a four bedroom house that can sleep up to 9. Three queen Bedrooms, and a fourth bedroom with a double bunk, plus two single beds. Two Bathrooms (one en-suite). Note no schoolies booking taken - sorry. Just 2.5 hours from Sydney. A quite village on the shores of St. George Basin. Just 4 Km's from Hyams Beach which is great for swimming or chilling on the beach. Or there is one of the most beautiful walks along Jervis Bay... and if you're early you can catch a sight of the dolphins. There is a great general store within walking distance for all those last minute things. Good public boat ramp less than 600 meters from the house. The Palms is perfect for those wishing to spend some time on or near the water. Situated on St George's Basin, and close to beaches such as Hyams, Caves, Murrays and Greenpatch. Kayaking, boating, water skiing, fishing, snorkeling, diving, swimming and surfing. Great bush walks surround the area, including those in the National Park. There is a fantastic esplanade walk from Huskisson to Vincentia, which takes in views of the water. Restaurants and cafe's close by, including the recently renovated Husky Pub, Thai, Indian, Mexican, Italian and good-old Fish n' Chips. You can catch a movie at Huskinson or choose from one of the many DVDs at the house. Alternatively, you can spend some quality time at the house, playing a game of badminton or soccer on the grass. The Markets are on frequently, and there are many boutiques in Huskinson offering a range of home-wares and clothing. Why not see the Whales / Dolphins - We can offer 15% off a Cruise! RATES:-Pricing is subject to change, and a minimum stay period and other conditions may apply. You should confirm pricing with the property owner. Note Sheets / Towels are $20 Extra per bed per stay. 4 K's to beautiful Hyams Beach where you find the whitest sand in the world. Close to the lake. Handy corner shop. Fireplace plus, Gas heater, plus oil fired heater. With lots of free wood. Large sofa that seats up to 7! Salt, Pepper, oil, sugar, coffee,tea. Plus lots more odd things! Great deck with outside table seats up to 8 plus outside chairs and a great Bali day bed. The Palms is a charming, well-maintained house. It contains everything you could possibly need for a great holiday. Clean, spacious all the little things like cooking oil, slices and dishwasher tablets provided. An easy walk to Jervis Bay and the general store. Beautiful, large living area and deck. Many colourful, attractive birds singing in the palm trees. Beautiful home! Comfortable and Cosy! We had a lovely stay at the Palms! Everything was clean and well presented, and comfortable. Proximity to shops (less than 5 mins to Woolworths, Aldi etc) and beaches (5-10 mins to the white sand beaches) is great! Everything has been thought of, you can cook a meal, get cosy on the couch and watch TV, or enjoy the lovely yard on the patio. Thanks Trish for a lovely stay! Thanks for the nice review pleased you enjoyed your stay. Beautiful home with a big backyard which has plenty of shade from trees in the afternoon. Really enjoyed sitting on the Veranda relaxing and looking at the trees and garden. Big lounge with a super comfortable huge couch to spend time reading books on. Ceiling fans make it nice and cool in the daytime. Really enjoyed our stay and would go again. Good location short drive to beaches etc. Safe rear garden for pets or kids. Pleased you enjoyed your stay thanks for taking care of our place. close to house. Thanks for making it such a great stay.